I stumbled across this great gardening website somewhere in the Internet ether recently called The Plant Exchange. It grabbed my attention because although not ‘the gardening type' I'm feeling the pull to join the veggie garden brigade in light of concerns that traditional food growing and production methods are not serving our land, our bodies or those countries who export produce at the cost of their own hungry people. The Plant Exchange is all about local growing and sustainable living. The idea is to offer gardening enthusiasts in the UK a forum to buy and sell surplus plants locally to reduce the amount of miles plants potentially travel if ordered from afar. So Ms Bonnet in Bedfordshire who has a spare 20 daffodil bulbs she can't make use of in her own garden can advertise on the website and make a small profit of say £4.00 or, donate proceeds to a charity of her choice. The website is brilliant for beginner green thumbs like me as it's simple to use and very informative without making you feel daunted about creating your own beautiful garden. There is a plant encyclopedia and a recipe section - always great for a vege garden apprentice to have a culinary goal to reach for! For the expert looking for an expert's advice, seasonal gardening tips are offered by a professional horticulturalist. The site also features a personalised weather service, the travelling distance from you to the plants advertised, local ecology news (for example updates on the recent outbreak of Sudden Oak Death disease) and a directory of garden clubs, flower arranging clubs and horticultural societies. You need to register and memberships cost £10 for the year. This is a fairly small sum when you consider that you're lowering your carbon footprint of bought plants. Also you save money by exchanging in your local area rather than buying from a nursery, which may import some of their plants and seeds. 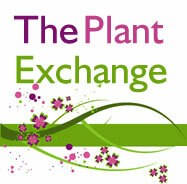 For more info visit The Plant Exchange website.